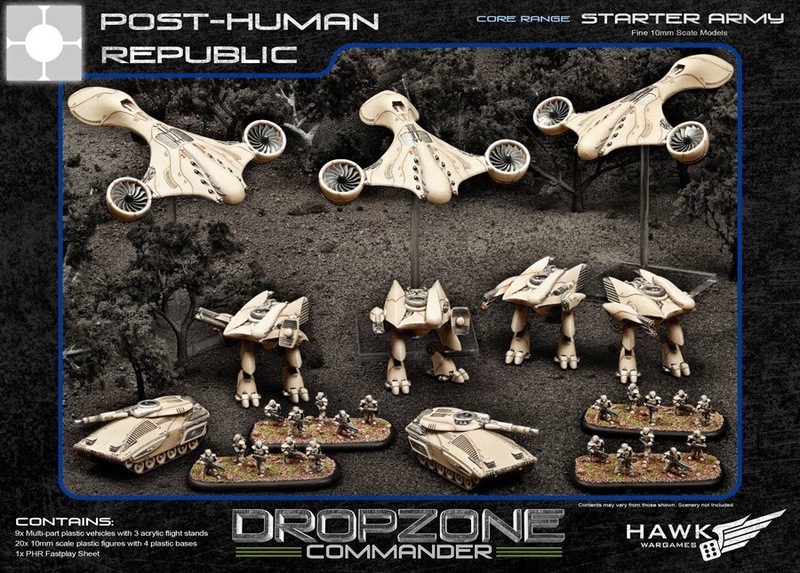 Last night saw Chris and I run our first Dropzone Commander game! 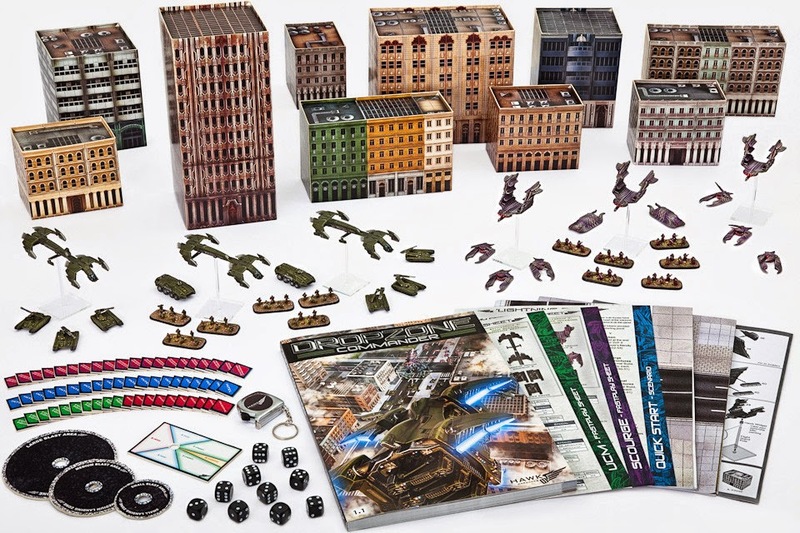 The game is produced by Hawk Wargames (http://www.hawkwargames.com/ ) and it is a 10mm Sci Fi game of fast moving dropships and building to building battles. We thoroughly enjoyed the rule set. It was fast playing, simple to follow and the alternating activations of Battlegroups (units) kept each of us in the game the whole time. The Mission : "Lightning Raid"
Basically, 3 objectives, 1 Victory point to control it, 2 VP if you get is off your board edge. Here is the board. Chris' PHR, assembled for duty! My starter set of UCM. Chris' PHR advance - note the top right dropship, making the push to the far building with the objective - AND how far my Condor dropship is away from it! I should have been more bold in my advance. On the other flank, Chris advances his AA walkers, and shoots down my AA transport Condor (bottom right). My AA Rapier tanks now have no ride, so 4" movement a turn is all I have. But I did squeek out a win, by running home to mommy!! Bottom left you can see my damaged Condor carrying my BEAR APC, with the remaining infantry of the UCM. My second squad located the objective in the central large building, and are booking it off my board edge for the 2 Victory Points. What cant be seen is the lucky shots my Sabre battle tanks got on Chris' APC that was trying to get a squad into that central building to take out my infantry. The Sabres knocked out the APC, and I rolled 4+ on each unit to wipe them out due to the explosion. The game ended with a 2-1 VP spread in UCM's favor. It was really fun, smooth to play, and the alternating unit activation, coupled with choosing to move then shoot, OR shoot then move with your units opened up loads of tactical options. Chris definitely had me on the firepower side, and his units where tough (I only killed one APC, one transport, and one walker), but the back and forth felt like it could go either way. Dibs on the MadMax err I mean Resistance guys.. School bus with guns? Sign me up.